There’s no fire in this dragon, just the warmth that comes from his heart. 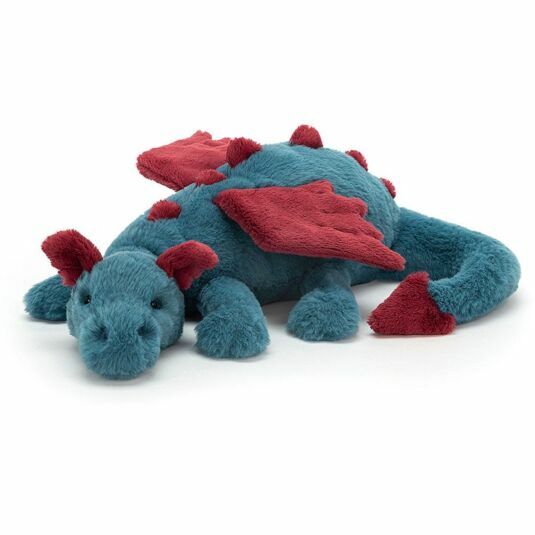 Dexter is the kindest, softest and cutest of all the dragons. Whilst his brothers and sisters are battling with orcs, dwarfs and elves in far-flung lands, Dexter is at home snoozing, relaxing and dreaming of the day is new owner will give him a big warm hug. With velvety chalky blue skin, soft maroon horns, magnificent wings, a curling tail, and a cheeky grin, how can you resist his mythical charm?! Dexter is perfect for keeping you cosy with cuddles at night or giving as a birthday, Christmas or Valentine’s Day gift to any of your loved ones.